So I'm wondering what other people do to de-stress? I have a grandson who loves to play video games as an escape (not the violent kind, his parents won't let him). I tried that once, years ago when I bought our kids the first primitive video game system. I can't remember what it was called but it had Smurfs and Super Mario and other harmless and non-violent games. Oh, and Pacman. I tried one in which you had to shoot ducks as they came across a fairground booth. Talk about stressful! The more ducks you shot the faster they came. My palms were sweaty. My heart was racing. So not the greatest stress-remover for me! And there was the time when I thought that fish might be a good idea. Looking at a tank of tropical fish is supposed to be soothing, isn't it? We bought the tank. 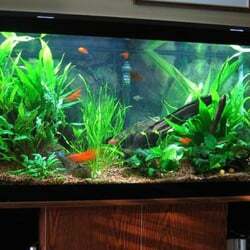 We stocked it with tetras and mollys and all kinds of bright and beautiful fish. And then John gave me a book on fish diseases. Disaster! Fin rot and Ick and others I can no longer remember. So I started to stare and worry. Was this one swimming funnily? Oh God. He didn't have Ick, did he? And why was that one lying quietly and not swimming? Rush to disease book and see what might be wrong with it. So no fish for me. But my son is a fan of meditation. You can do it anywhere. No equipment needed. Me: How do you empty your mind? I cannot catch all those rogue thoughts rushing around. ME: I'm visualizing. It's warm and red and--wait. Did I turn off the stove? ME: Was that the mail coming? Mail? OMG. Did I mail that review copy I promised? You get the picture. My mind will not stay calm and still for five seconds, let alone for ten minutes. But what does work for me is sitting in the sauna at my health club. It's like Pavlov's dog--the moment I sit on the bench my breathing slows. Tension flows away. So how do you cope with stress? What works for you? Stress makes life crazy . . . I can’t do the sit quiet and meditate thing, either . . . too many thoughts keep popping into my head. If I’m just a little stressed, a nice cup of tea and a few minutes of relaxation is perfect. If it’s a bigger stress, then I need my coffee. And if it’s more than I want to deal with, it’s time to open my book, forget about it, and read for a while . . . .
Joan, that's my favorite way to deal with stress as well! Yes, there has been a lot more stress in my life this year than I was expecting in my first full year of retirement. My normal go-to method to destress was to be outside and take a brisk walk (or snowshoe in winter). Those feel good endorphins calmed me down and enjoying the flora and fauna outdoors was great. Unfortunately, since I am laid up with my broken ankle until March, I am having to resort to indoor distractions. I usually don't watch much TV (no cable) so I have watching more Netflix and Youtube videos than ever before. And of course, finding an escape by reading an enthralling book is another way to forget about my troubles for a while. Another way I cope with stress is to COOK (and EAT)! The first two weeks after my accident, I was eating a lot of comfort food and all the things I normally do not eat: bread, pasta, potato chips! But I am back to my normal eating routine now, and am cooking and eating better. The one treat I usually enjoy is good artisan chocolate. Good, artisan chocolate is an antidepressant for sure, Grace. I always keep some on hand for medicinal purposes. I'm sorry about your ankle, Grace. As a fellow hiker, I can only imagine how difficult it must be. I'm another one who tends to turn to comfort food when stressed, and I've done it more than I'd like since I've been unemployed. It's especially tough at this time of year with all the goodies! Gigi, I will happily label my chocolate consumption as being for medicinal purposes. Mary, thanks. It has been a big adjustment from walking/hiking 10-12 miles/3 times per week to only being able to hobble on cast and crutches for 1 city block! My upper body is getting a nice workout to pull myself up the stairs but I am definitely missing the workout highs and being out in the fresh air for my regular stress relief. The flaw with medicinal chocolate is exceeding the recommended dose. Not telling how I know this. Side effects from medicinal chocolate may include bloating. Permanent bloating. Puttering in my garden works as a stress solution for me; deadheading roses can be hugely therapeutic. Reading, napping, writing in my journal if I have a specific problem to sort out, and simple computer games like solitaire or sudoku also work, though I'm like Rhys in that I don't like escalating levels of "challenge." I enjoy the puzzle, but I don't need to have my life depend on it. Meditation? That works, too. For those of you who "can't clear your mind," you really don't have to. What happens to you is called monkey mind, and it's normal. Just note that it is happening, and bring your mind back to your breathing, or find a more active form of meditation, like walking or, for me, quilting. Just focus on being wherever you are, right now, in the moment, and let the rest of the stuff go. But the very best de-stresser ever for me? So simple. I let down the tailgate of my old truck and sit there, in my own back yard, with one of my dogs leaning into my side. We watch the other dogs, or the birds, or the stars, or the wind in the big oak trees, and all the stress flows away. A little slice of heaven! I love the picture of you sitting on the truck with your dog, Gigi. I need to take a picture of Gigi sitting on the truck tailgate with Zoe! And for those of you frustrated with meditation, I learned Transcendental Meditation way back eons ago. They give you a word to use, but you can make one up. Three syllables, nonsense, with a nice cadence. You don't try to "clear" your mind. You just bring it back to the word, and keep doing it. Laughing here - whenever I need a good think I put my headphones on for guided meditation. Never knew I had so much to think about until I try to empty my mind! Gigi's suggestion is exactly what I've been told on guided meditation and the technique does work. I often find the solution to knotty problems bubbles up soon after a session too. Don't know if that's supposed to happen. My first choice, if possible, is to lace up the sneakers and go for a good hard run! The sound of sneakers hitting pavement is a kind of meditation, too, I think and at the end I feel calmer, and happy. I find the easiest way for me to get rid of stress is to only care about things I can do something about. I don't pretend to care about things I really don't. Must be doing something for me because when I went to the doctor 3 weeks ago, the doctor was very happy with my blood pressure. My daily long brisk walk is a good destresser, as is the weekly gentle senior yoga class. Last night I was definitely feeling overcommitted and beleaguered, and it's not just holiday stuff. So today I'll take a deep breath, make a list, and start doing all the quick easy items as soon as I've done my daily word count. Or maybe I'll do the hard ones I've been putting off for a week! Walking is good - walking on a beach is better! I very often can lose myself in a book but sometimes I just need to let thoughts wander around in my brain and for that jigsaw puzzles work great! Stress is a dead laptop with an estimated repair time of 2+ weeks. But I will persevere. Long walks with the dogs, the last of the yard chores, cleaning bathrooms and counting towels and blankets before the entire family descends for Christmas. Somehow writing down all the things that are niggling away at me helps me put them aside and calm down. I keep notes on a pad on the kitchen counter and when I have access to the desktop, scramble to throw them into my two WIP files. I stumbled into a great interview this morning when I was running errands, with all the facts I needed to move forward with a short story. I WILL make it work. Beach walks work for me, no matter what the season. Lately I've found refuge watching the British Baking Show. Amazing how tuning in to others' stress alleviates mine . . . I am out in the woods walking most days - it's the only thing that keeps me sane. I have monkey mind when I try to meditate, too. The motion of walking seems to calm it somewhat. Oh gosh, the monkey mind! I have that too. Yes, walking helps quite a bit.Sometimes I actively, say to myself, Back to the topic. I have to sort of rein my thoughts into focus.I’m all about lists,?as you know. Even a schedule, hour by hour. So silly what we have to do. I took tai chi for a while, and that was terrific, except I kept saying to the teacher: am I good at this? Am I good student? Am I doing it right? He told me: that’s not exactly what we’re striving for in tai chi. Hank, when I'm feeling overloaded I have to make lists and schedules for the things on the lists. Not that I will get everything done but at least I feel better! Exactly, Rhys! And yes, Debs, it's like making a budget. You realize what's doable, and what's not. And that, in some cases, it's not a bad as it seems. Wow, HPR, you sound quite like me. I was going to do surgical residency for a long while - surgeons are pretty dependable about giving feedback. Now I find that walking in nature, even for a short while, can be good for erasing the mental chalkboard. At least, it's helpful for me. Sometimes I bring an iPod. Skiing does the same thing - nature and movement and quiet (or my choice of music), really helps. I seem to be able to keep stress at bay by being active and tackling the things about which I'm feeling the most stress. Completing a task that was feeling stressful gives me a sense of satisfaction, as does crossing it off a list. As does ice cream ;-) My problem is that when I go to bed, all my worries reappear. I'm working on improving my sleep hygiene, as they call it, but that hasn't stopped the worrying. Still working on this. As Hallie said, lists help. Jim, I sometimes have the same thing - the lights are out, I'm comfy, but all my problems and to-dos keep churning. This may sound weird, but I do mental math problems. Usually something positive like, how much will my IRA grow at 4% over ten years. The thing is, I'm terrible at mental math, so I really have to concentrate. I always fall asleep within a short period. If maths are too easy for you, you can also get the same effect by reading a poem before you turn out the light and then memorize it while settled in your pillow. Again, it's the blocking-everything-else-out part that works. One of my special ways to help myself back to sleep is to list the state capitals in alphabetical order. Someplace I read to try counting backward from 700 by 8s. The often works but I like the states thing better. Alcohol! Set up an IV. Shoot that stuff straight in. Some days lately that seems like the only possible solution! Now that it's cold, sitting and watching the flames in my wood stove is a great de-stressor. In the summer, I like sitting out on the deck watching the butterflies on my neighbor's bush. Good suggestions here--I will often take a walk--a walking meditation, where I reach out with my senses and feel--the cold, or the warmth of the sun, the soft breeze--see the shapes of trees, the colors of leaves, the cloud shapes--listen to my breathing, bird calls, leaves rustling--acknowledging my monkey brain, but returning my focus to the moment over and over. And Hank, I took a very simple tai chi class and in the privacy of my own home or backyard, I will do a series of movements, concentrating on the feel of them, slowing to feel the energy--and this too works to calm me--I don't worry about 'am I doing them right?'. My instructor once pointed out that if you were to stand back and watch a class, you'd see everyone doing the movements as best they can. Books are good, too, but sometimes reading is just delaying the inevitable return of worries, so I try to tackle the ones I can deal with. And at night, Jim, when the worries spill out into the silence of night, I can sometimes relax by repeating a silent prayer or mantra or even mentally going through tai chi movements. What lovely writing today, Flora! Flora. How wonderful. Thank you. Flora, your words are my de-stresser today. Thank you. Like you, I find reading is just a delay. Some times the stress is worse when it floods back at the end of the chapter. Stress isn't much of an issue for me these days. The leg is healing well and the skin thingie on my eyelid bears watching but neither of these are fatal. Walking the dogs is a time when I can't help being relaxed and happy. However, we have a foot of snow on the ground and the ploughs haven't been thru. So instead I'm watching "A Child's Christmas in Wales" and wondering if I can unearth enough Christmas cards to get the grandchildren's money off to them today. Plenty of time though. I sent all my children and their spouses 23 and Me kits plus a Robertson's ham or smoked turkey and smoked summer sausage. That job is done. All I have left is to wrap the small presents for our tree. Oh. The tree. Must get that up too. Being a lady of retired leisure, none of this is worrisomel. Last year we entertained Julie's ENTIRE family for Christmas. THAT was stressful. This year we will be on our own, sleeping in after coming home at 2 a.m. from Christmas Eve Mass. I'm thinking cioppino for Christmas dinner, after sausage rolls at breakfast and with mince pies for dessert. How hard can it be to make soup? I do it every week. I wish it were time to start the baking, but that won't happen for at least another ten days. Julie's mother used to make date bread, and once she could not longer manage that, I started. I bake about a dozen loaves, some for giving away, one for keeping, and the rest go to the family with a little note, Merry Christmas from Mom. There's never a dry eye. Besides all the above, we'll make and decorate tons of sugar cookies, mittens and bells and stars and santas and trees and wreaths that, turned upside down, look like little kitten heads. Maybe this year I'll make madeleines, too. And a cup of tea. And search for lost time. Lovely writing from you, too, Ann! And you Christmas sounds wonderful. We just saw "wintry nix" in the forecast for Christmas Day and are jumping up and down with excitement. Another person who does sausage rolls and mince pies! Yay. I have to make them every year as part of my tradition. Time consuming but taste great. Like Mary Berry. I use frozen puff pastry. Makes sausage rolls a 30 minute effort, fridge to table. Do you make them bite size with two slashes on top? Just felt it needed to be said. My living room and dining room are all decorated for Christmas, so my favorite de-stresser at the moment is lighting a fire and sitting down in the living room with a cup of tea, just enjoying the coziness. I love taking walks, and playing ball in the back yard with the dogs. Nothing like dogs and babies to take your mind out of the worry rut! Cooking is meditation for me, too, most of the time. And soaking in a hot bath! Oh yes, Debs. A hot bath, with classical music playing! I will happily walk the beach with you, Rhys! Your post makes me realize my only coping skill is to consume copious amounts of coffee and candy! Ack...I am going to try and meditate now...or maybe nap! Enjoying everyone's strategies. Walking in the neighborhood helps: air, exercise AND knocking off some chores all at once. Hot bath. Music.Accepting I must delegate - and doing it. Mostly? Accomplishing something - anything!- whether it is writing pages (why am I here right now, you ask? ), organizing anything at all, doing some cooking. You trying to meditate sounds about like my mind. I can not shut it off, and the more I try to focus on nothing, the more thoughts flow through my mind. I have to find a way to relax. Let me add it to the list of things to stress about. I'm so stressed I can't talk about it. I'm afraid it won't go away any time soon. Meditation has never worked; my brain is too ADD. Thoughts bounce around like spilled bbs. About all I can do is try to be a hermit for as long as it takes. Unfortunately my husband is the anti-hermit. And that damned phone keeps ringing. I'm sorry you're going through this, Pat. My son the life coach says deep breaths, focusing on your breath. Stupid phone. I hate the thing. Reading, playing solitaire, especially spider solitaire, which is more challenging. But I have to take it off my device or it becomes an obsession. These days I'm more likely to read, sit by the fire, or work in my garden. Those are all my de-stressors, especially if I have good music to go along with it. However, when my kids were at home, and my husband was traveling, and we had a million worries, my dear cousin gave me a great tool. She (a lesbian who nearly became a nun, so someone with a great deal of empathy and spiritual presence, and one of the kindest people I've ever known) suggested meditation. When I said I didn't know when in the world I'd have time, she said to do it in the bathtub. Which worked so well. Mary Ann's suggestion was to lie back in the hot water, close my eyes, and picture the water running towards a vanishing point, with my vision at the water level. Since the water was draining a little because of displacement, it was easy to visualize, and made all the difference. The visualization gave me something to focus on, and stopped the monkey brain. It helped me to sleep better, too, since I bathe at night. I should start doing this again, actually. Thanks for the memory jog! I am a failure at relaxing. It's one of the things I stress about. Meditation ? Nope, can't do it. I've tried. Reading , if I can stay awake, is good for reducing stress. Walking is good,and I need to do more of it, but now I'm dealing with joint and nerve pain, so sometimes it just makes things worse. Bookstore therapy or library therapy...that's good. i can get lost in shelves of books for hours. Unfortunately, I have now bought way more books than I will ever be able to read, and my house is full. So now I have a new source of stress. I have to get rid of some of them. I tend to go with Joan's method of a cup of coffee and a book. If I'm especially stressed, I turn to my specialty coffee, Jamaican Me Crazy. It's a coffee I buy in a local gift shop that is a favorite place of mine to visit, and the ladies that run the shop are favorite people of mine. All great associations to have when drinking the delicious coffee and reading a captivating book. Since my first comment seems to have disappeared, let me just say that most of my stress is dealt with by simply shutting out the world and shutting down my mind to focus on only the things I truly care about. I've got to come up with three music related Top 10 lists, plus finish a couple more CD Reviews and figure out my Top 10 movies and books lists as well. (A certain Jungle Red is going to be very happy, BTW). So I don't have time to deal with holiday related additional stress. My stress antidotes are exercise at the gym, lots of walking, baths, reading, spending time with my hubby and other people I love, and tuning out the world to some extent. If I ingest too much news or social media, I find my stress level rises, so sometimes I just have to back away from the computer. And chocolate. Did I mention chocolate? This made me snort, it was so perfect for me. A little story. I'll try to be brief. Last January, I had an islet cell transplant. In short, this is a big surgery with an expected one year recovery time. On a separate note, I'm sometimes known as "stubborn." When I decide something's necessary, it can be very difficult for loved ones to change my mind. So, going into this transplant, I decided that I would need a therapy dog. Sounds great, right? Except that therapy dogs are pretty expensive, and I've had dogs for years, so... no problem, I'll just get a puppy. A nice Labrador puppy. And I'll train him, and he'll be the perfect therapy dog that I need as I recover from surgery. He'll reduce my stress, he'll help me start walking and jogging again... and I'll love him, and pat him and call him George. You get the idea. Only, this was a terrible idea. NEVER make big decisions like this when you're really ill, LOL. But no one could dissuade me - I'd always wanted a Lab, and training him would be easy-peasy, the kids would help, yada yada. So, January came, I went through the surgery, had every complication in the book, and went home ten days later. February came, and with it came Tucker, the eight-week-old Lab. Did I mention that this was a bad, bad idea? So my stress reduction plan failed. Badly. I ended up with a bouncy, energetic baby just when I needed rest and recuperation. Today, Tucker and I are learning to work together, but man... though I adore this dog, he does cause more stress than he alleviates. During the illness, a friend sent me a lavender-scented heatable eye-pillow. That helps. Also, warm showers, reading, writing, and listening to music seem to help. Venting on blogs like this one - HA! - also reduce my stress. But getting an 8-week-old puppy immediately after voluntary evisceration is NOT the way to go. Fish would be better, I think. Be well, all, and Happy Hanukkah to those who celebrate! For you from Jungle Red: Almost a Poem! A Weekend in the Country? Bill? Or Kevin? And Why? Much To Do About To-Do! What Do YOU Do?